The Northern Ireland Environmental Benchmarking Survey assesses the extent to which environmental business practices have been embedded within the corporate strategies and operations of local organisations. Since 1998, the Northern Ireland Environmental Benchmarking Survey has pushed the environmental agenda to the fore, assessing the extent to which environmental business practices have been embedded within the corporate strategies and operations of local organisations. The NI Environmental Benchmarking Survey is open to all organisations in Northern Ireland. If you would like to register to take part, please contact keelin.mccone@bitcni.org.uk. The Survey benchmarks organisations against both their sector peers and against leading Northern Ireland organisations based on their environmental management and performance in key areas. It is a voluntary exercise that helps organisations identify environmental impacts, measure progress, drive improvement, and raise awareness of the environment as an important, strategic and competitive issue at board level. The Survey has grown to become Northern Ireland’s leading environmental benchmarking exercise, attracting organisations from numerous industry sectors, including participants from the top 200 companies and leading public-sector organisations, such as health trusts, local authorities and universities. 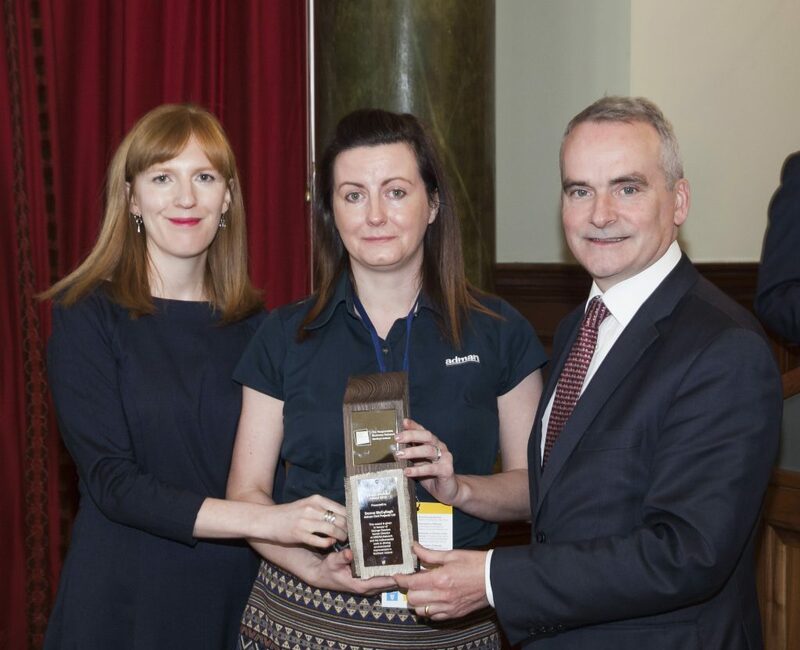 It is now recognised as a positive influencer that is helping organisations throughout Northern Ireland to achieve more sustainable ways of doing business. Does your organisation employ less than 25 people? If so, you will be eligible for our new Small Business Environmental Benchmarking Survey. Through this Survey, small businesses have the opportunity to demonstrate their environmental credentials alongside the major players in Northern Ireland. If you would like to register to take part, please contact Keelin McCone. Over the Survey’s 20 years, organisations have come and gone, been bought and sold, renamed and restructured. However, through all of this change in the business landscape, 11 companies have taken part in every Survey since 1998. Additionally, 23 participants have completed the Survey for at least the last 10 consecutive years. Click here to download the 2018 Northern Ireland Environmental Benchmarking Survey Results. Click here to read a special supplement featured in the Belfast Telegraph, to celebrate 20 years of the Survey. Already involved? Why not ‘Bring a Business’? The Bring a Business initiative asks Survey participants to encourage one of their key suppliers or contractors to take part in the NI Environmental Benchmarking Survey, in an effort to challenge participants to work with their supply chains to improve their environmental impacts. Organisations who ‘Bring a Business’ will gain extra marks in their own submission. Please email with the organisation name and contact details by 31 May. If your organisation participated in the 2018 NI Environmental Benchmarking Survey, Business in the Community can provide you with a Survey Gap Analysis Report. These reports are free of charge to Business in the Community members and charged at £50 + VAT to non-members. If you would like to request a Gap Analysis please contact Keelin McCone. The George Dawson Award for Environmental Contribution was established in 2008 to pay tribute to the memory of George Dawson, a former Director of Business in the Community. George passed away in 2007, following a short illness. During his nine years with the organisation, he developed the environmental campaign into a highly respected and successful driver for corporate environmental improvement in Northern Ireland. This recognition award is designed to celebrate the significant contribution made by a business person to improving the environmental performance of his or her organisation and its impacts upon the environment and wider community. 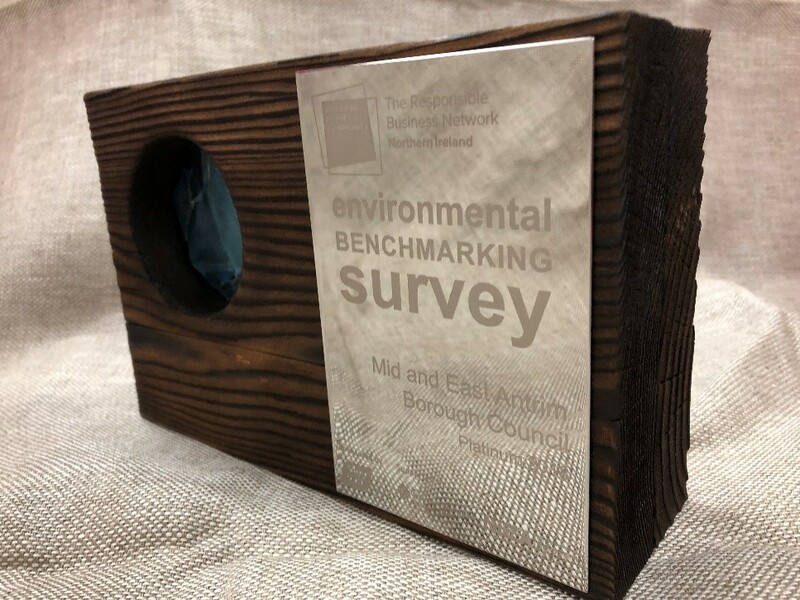 The 2018 Northern Ireland Environmental Benchmarking Survey’s trophies and the George Dawson Award were made by local supplier David Keys Sustainable Woodworking. David runs an ‘unplugged’ workshop, where he uses ‘old-school’ hand tools to reduce electricity consumption. Most of the tools he uses date back to before the Second World War, and he has restored them back to their original condition. The trophies are made from broken fencing posts and offcuts from a shed manufacturer, and the glass inlays were made out of used glass from Bombay Sapphire gin bottles, making them truly circular. For more information on both the Northern Ireland Environmental Benchmarking Survey and the Small Business Environmental Benchmarking Survey, email Keelin McCone or call (028) 9046 0606.